ONI Bureau: The ‘Egg Attack’ debate is back. 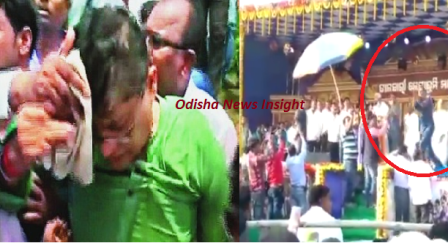 Just a few months ago, BJD MP Baijayant Panda was attacked with Eggs, stones etc. during a project inauguration in Mahanga in Cuttack district. For 4 months, no action was taken against the perpetrators. And, when action was finally taken, the case was diluted and it was treated just as a law and order issue. However, when the wife of a BJP worker, protesting the detention of her husband, hurled eggs at CM’s meeting in Balasore, she was not only assaulted by BJD workers at the meeting venue in the presence of Naveen Patnaik, but also was charged with Section 307 (Attempt to Murder). When the law is same in all cases, why the cops adopt different approach and apply it as per their convenience? Our Debate Topic: Should there be uniform approach under the law without any bias or exception for all #EggAttacks in future? Sanjay Kuma Pradhan: Yes, as the constitution declares it in the preamble to give equality of justice. Where there is a discrimination between a CM and a common man, it’s not a good sign. IPC 307 is equal for all. Those having power and money, should get any exemption. There should not be any politics. If the administration and police fail to respect the law, people may take it into their hands. Suvendu Mohapatra: Any attack should be condemned. There should be an uniform law strictly executed without any bias or discrimination among all. The message should be loud and clear. When the attacker of CM is booked for attempt to murder and others are let off with mild charges, it would not be a healthy trend; rather it would erode the trust of people in the government. Sandeep Sahu: The law is already uniform. It is just applied differently by the police to keep their political masters in good humour. Sambit Nanda: If you bring new law, specifically for egg attack, then people may choose rotten tomatoes, rotten potatoes, rotten meat, rotten fish etc as substitute. It’s better to make the current laws stricter and more stringent. And, it should be ensured that it is implemented without any discrimination on the basis of caste, creed and political affiliation. Basudev Bhatt: Egg attack is condemnable. Dharana, Demonstration, Hunger Strike etc. are allowed though. Yes, law should be same for all. Devi Prasad Misra: Egg attacks or for that matter any type of attack during a political rally or meeting should be dealt as per the law of the land without showing any favour to the ruling party. Umasankar Sahu: Justice must not be delayed or denied at any cost, but surprisingly in our state Justice is very much delayed while it is very much needed. It’s proved time and again. We already have good laws and lawmakers, but things go slow when it comes to implementation. I don’t know why and how all these mishaps are happening in Odisha, not only odisha but also throughout India. I can just condemn it. ‘Vande Utkal Janani’.